The interview was hilarious! I live in his hometown. I am so proud of Dakota. We’re celebrating him on October 2. I wonder if Letterman, or obama for that matter, realize the greatness of these young men with whom they “visit”? 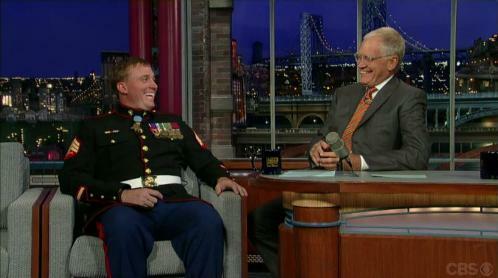 People like Dakota Meyer and all MOH recipients amaze me. People like Letterman and obama can never truly understand…. When I read the comment left by “Blue” on Sept. 26, I’m completely mystified as to how someone can take a proud moment for this young man and taint it with negativity regarding his own political views. The President awarded Dakota the Medal of Honor, which is is the highest military decoration awarded by the United States government. David Letterman invited Dakota to be on his show, which was the highest honor that he has the ability to give to someone. What exactly did Blue want David Letterman and President Obama to do (besides what they already did) to show their appreciation of Dakota’s accomplishments? I’m curious to know. But on a different note, what I would truly like to say is Dakota make me even prouder to be an American!